Step 1 Place the eggplant over a naked flame and cook for 15 minutes turning frequently, until the outside is charred and the inside is soft. Step 2 Cut the eggplant open and scoop the flesh into a bowl, squeeze in the lemon and the garlic. Add the cumin, oil, tahini and a good pinch each of salt and pepper. Step 3 Serve topped with hemp seeds, parsley and pomegranate. 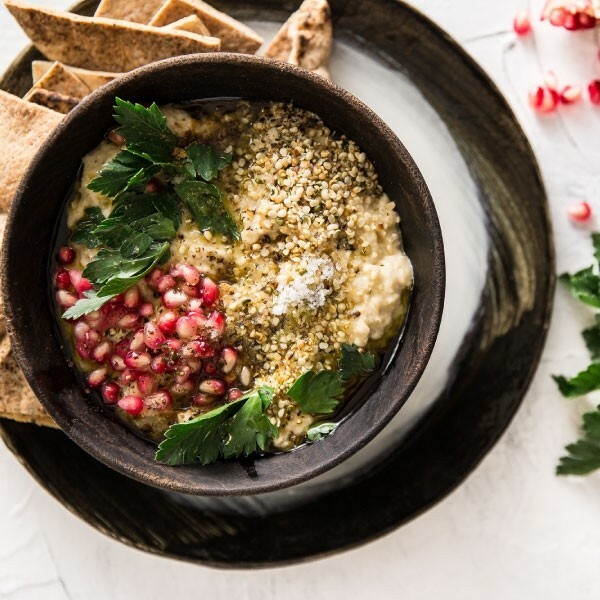 A rich, smoky and creamy recipe for a classic Baba Ganoush. Perfect for dipping, spreading and snacking!